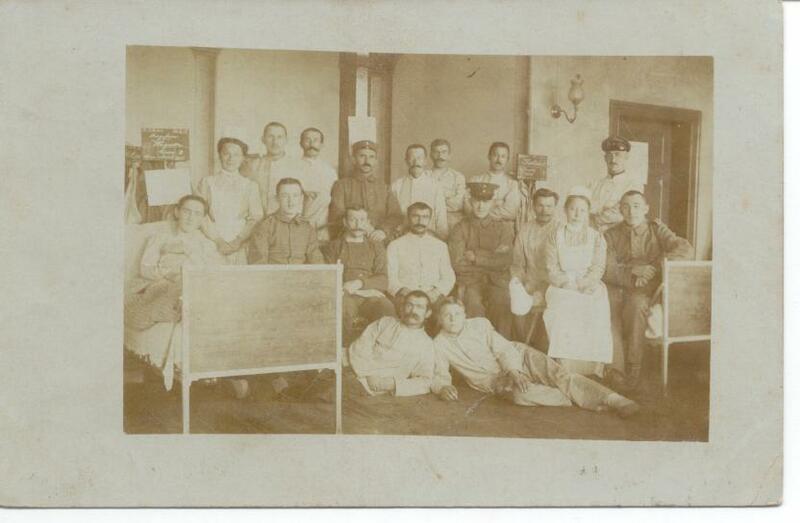 This is a 3 1/2 x 5 1/2 inch photo postcard showing war wounded posing with nurses. No handwriting on the reverse. This one is in great shape. Especially for being at least 87 years old. 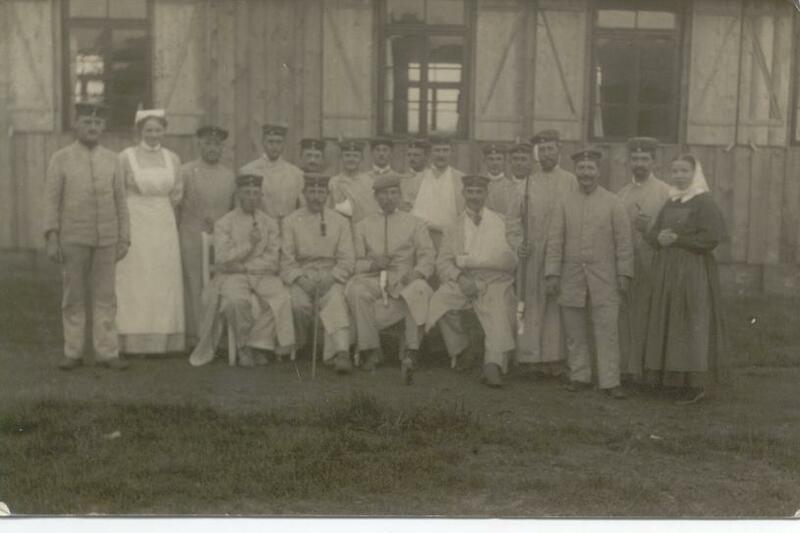 This is another photo postcard showing war wounded posing in a hospital ward with nurses. It measures 3 1/2 x 5 1/2 inches. There is a notation written on the reverse. It has the dates December 15 & 16 1914. There is some spotting and soiling to the card, but it does not detract from its focus. Afterall, this one is 89 years old. 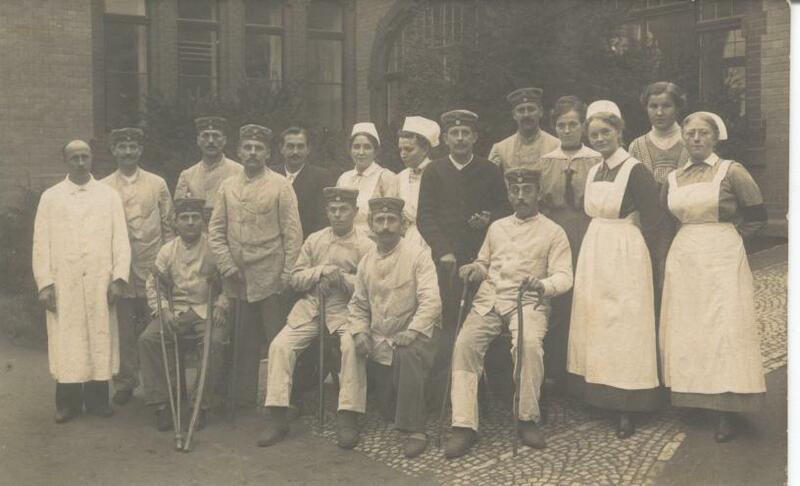 More war wounded posing with two nurses. It has been used as a postcard and has a message written on the reverse in pencil. It is dated 10-28-14 and postmarked the same day in Einbeck. It measures 3 1/2 x 5 1/2 inches. It has a few dings to the corners, but is in great shape for being 89 years old! This is a 3 1/2 x 5 1/2 inch photo postcard. 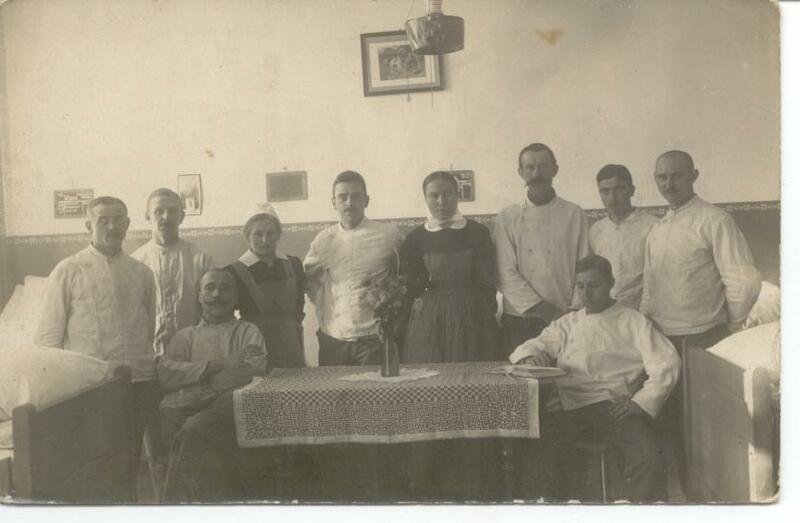 Pictured is what appears to be male orderlies and two female nurses in a hospital ward. This one has a note written on the reverse very neatly in ink. It was never mailed or addressed (possibly sent in an envelope, as I can see a indentation for the post mark). It is dated December 16, 1917. The corners are rounded from age and it has a few spots here and there. It is in great condition for its age, though! 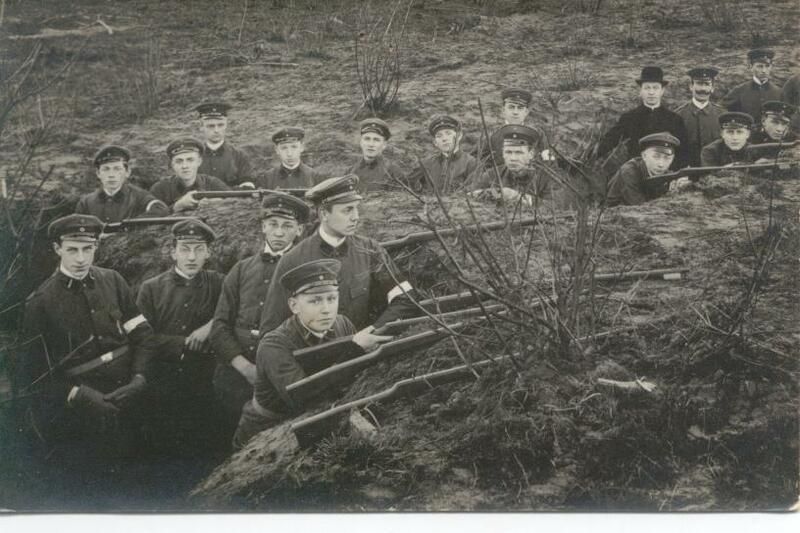 This is a 3 1/2 x 5 1/2 inch photo postcard showing some very young soldiers in a trench with rifles. It appears to be a training exercise. There is no writing on the reverse. There is some wear to the corners and a few spots from age on the reverse. Someone must have thumb tacked it to the wall or bulletin board, as there are two tiny tack sized holes at the top. They are barely visible (I almost missed them). They do not detract from the focus of the card. This is an actual photograph that measures 3 1/2 x 4 5/8 inches. It shows eight soldiers joking around. One of them is in a wheelbarrow. The others are surrounding him. Two soldiers have their bayonets out and another has a watering can. Zossen 1915 is written on the bottom margin. 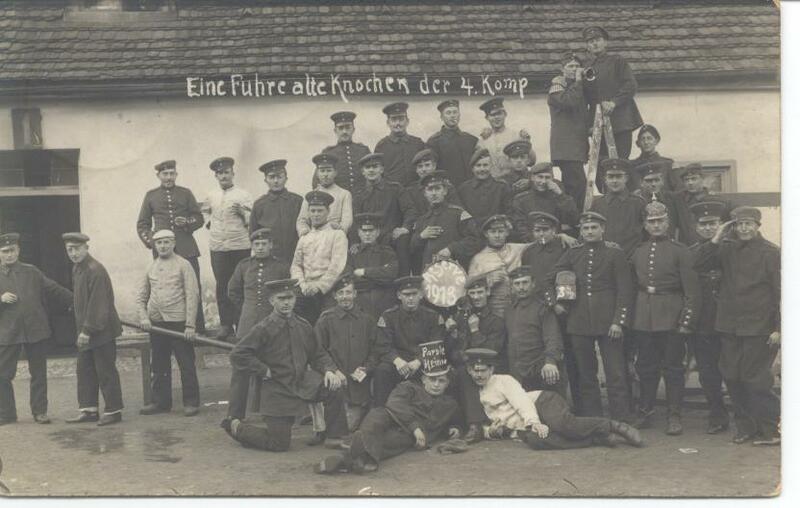 The reverse contains names of each soldier and June 1915 Zossen is written at the top. The photo paper is yellowing from age and has a few spots here and there. One corner is also scuffed. The picture remains clear. I would say that this one is in great shape for its age. This is a 3 1/2 x 5 1/2 inch photo postcard. 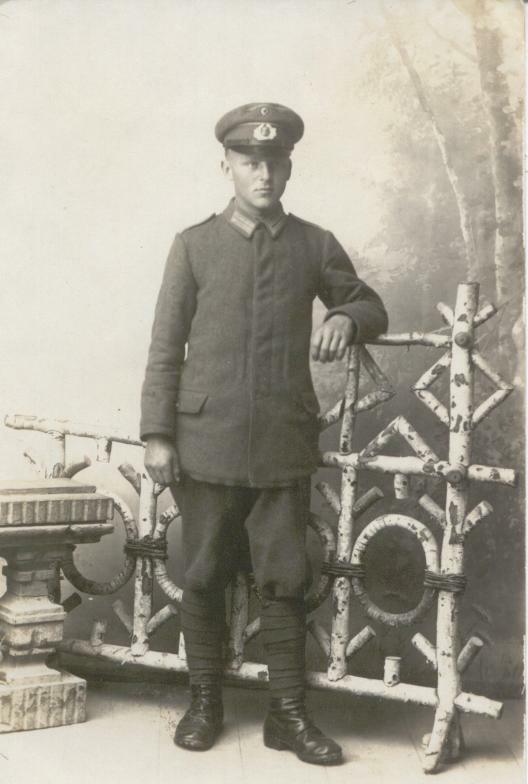 It shows a lone soldier posed in a studio. The reverse contains no writing. The corners show some wear and there is a spot of something by the soldiers right foot. It is only visible at an angle, so it is not distracting. A very nice photo postcard! This is the standard 3 1/2 x 5 1/2 inch photo postcard. I love some of the group poses, as these guys like to joke around. This one has Eine Fuhre alte Knochen der 4. Komp written above the group. The reverse a note written on it and it was mailed to Berlin on 11-10-12 from Rawitsch. Some light wear to the edges/corners and some spotting from age on the reverse. It is in great shape for being 91 years old! This is the standard 3 1/2 x 5 1/2 inch photo postcard. 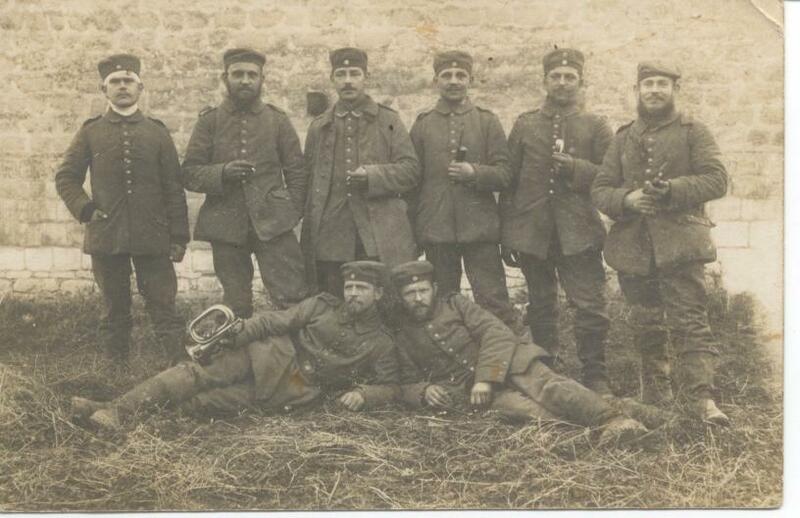 It shows 8 soldiers posed for the shot. 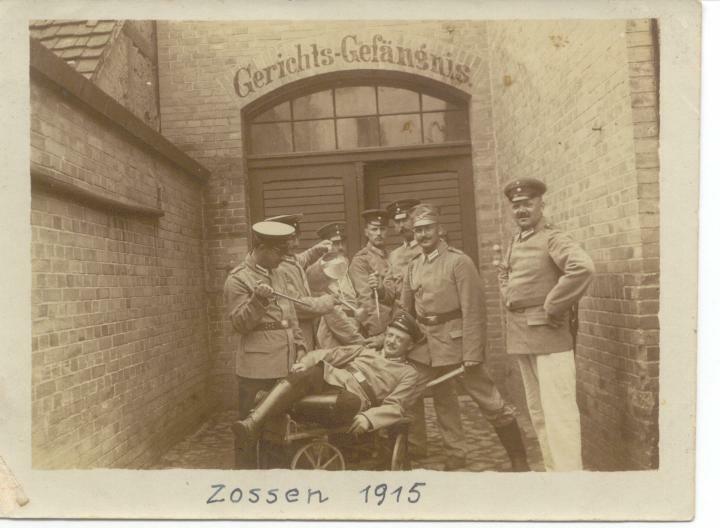 One of the soldiers is holding a bugle and another appears to be wounded, as his head and neck look to be bandaged. There is no writing on the reverse, One corner has a small crease and the others are slightly rounded. There are a few spots on the front and reverse. The ones on the front do not distract from the focus of the picture.